London Mayor, Ken Livingstone, has pledged to provide an army of robot fighters to help combat the over population problems caused by pigeons in Trafalgar Square - one of London's top tourist attractions. The robot army, due to go into production in early 2007, is the latest development of Livingstone's ongoing vendetta with his avian nemesis. 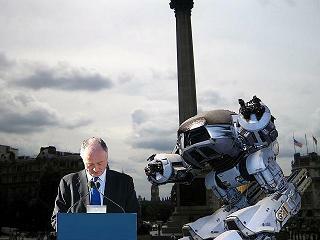 Although use of the ED-209 by world leaders has become cliched, it is believed Livingstone is the first British Mayor to call upon their services. "To most people, pigeons are just a nuisance," unofficial biographer Keith Wilson explained, "But with Ken, they have proven to be the roadrunner to his Wile E. Coyote, the Bugs Bunny to his Elmer Fudd, the Tony Blair to the British Electorate... he's always trying to stop them, but they always seem to be there laughing behind his back having the last laugh." Wilson claims to have gained this insight after reading that Livingstone had described the pigeon population as "rats with wings" and had tried to rid the Square of pigeons by hiring hawks. "That's probably where he went wrong," Wilson continued, "He should have employed them full time; anyone who has ever hired contractors before will tell you they'll spend most of their time on break and the rest of the time pretending they don't speak English or don't understand what you want them to do." Unfortunately for Livingstone, the hawks did little to improve the situation, whilst 120 pigeons were being killed each day by the predators - there was no impact in the overall population. Also, as the hawks were killing more pigeons than they were needing to eat, more labour was required to dispose of the dead pigeons - bringing the total costs up to nearly �10,000 per day. "Again, this is crazy," Wilson added, "�90 per pigeon? Why not just pay a load of homeless people �5 a day and let them keep what they collect for lunch?" "This is ridiculous," their spokesperson declared, "Pigeons have just as much right as humans to visit the capital if they want. We should be encouraging tourism, it's a great source of revenue. From what I can tell, there are far too many American tourists in London as well. What would be the reaction of the conservative press if we suddenly employed a lion to go around reducing their numbers?" "It's crazy," he said, "Everyone associates Trafalgar Square with pigeons, they are as much a landmark as Nelson's Column - and certainly better known than that armless legless statue thing in the corner. Everyone knows that 75% of tourists take pictures or pigeons or seagulls on their holidays. Granted, at home they cause no end of problems, crapping on the car, crapping on the drive, crapping on the kids - and I shoot the hell out of them with my shotgun. But Trafalgar Square without the pigeons? Hell, there'd be nothing to see."